We study the distribution of the discriminant D(P) of polynomials P from the class Pn(Q) of all integer polynomials of degree n and height at most Q. We evaluate the asymptotic number of polynomials P ∈ Pn(Q) having all real roots and satisfying the inequality |D(P)| ≤ X as Q→∞and X/Q2n−2→ 0. V. Beresnevich, V. Bernik, and F. Götze, Integral polynomials with small discriminants and resultants, Adv. Math., 298:393–412, 2016, available from: https://doi.org/10.1016/j.aim.2016.04.022. V. Bernik, V. Beresnevich, F. Götze, and O. Kukso, Distribution of algebraic numbers and metric theory of Diophantine approximation, in Limit Theorems in Probability, Statistics and Number Theory, Springer Proc. Math. Stat., Vol. 42, Springer, Berlin, Heidelberg, 2013, pp. 23–48, available from: https://doi.org/10.1007/978-3-642-36068-8-2. V. Bernik, N. Budarina, and F. Götze, Exact upper bounds for the number of the polynomialswith given discriminants, Lith. Math. J., 57(3):283–293, 2017, available from: https://doi.org/10.1007/s10986-017-9361-4. V. Bernik, N. Budarina, and H. O’Donnell, Discriminants of polynomials in the Archimedean and non-Archimedean metrics, Acta Math. Hung., 154(2):265–278, 2018, available from: https://doi.org/10.1007/s10474-018-0794-y. V. Bernik, F. Götze, and O. Kukso, Lower bounds for the number of integral polynomials with given order of discriminants, Acta Arith., 133(4):375–390, 2008, available from: https://doi.org/10.4064/aa133-4-6. V. Bernik, F. Götze, and O. Kukso, On the divisibility of the discriminant of an integral polynomial by prime powers, Lith. Math. J., 48(4):380–396, 2008, available from: https://doi.org/10.1007/s10986-008-9025-5. Y. Bugeaud and M. Mignotte, Polynomial root separation, Int. J. Number Theory, 6(3):587–602, 2010, available from: https://doi.org/10.1142/S1793042110003083. H. Davenport, A note on binary cubic forms, Mathematika, 8:58–62, 1961, available from: https://doi.org/10.1112/S0025579300002138. F. Götze and D. Zaporozhets, Discriminant and root separation of integral polynomials, Zap. Nauchn. Sem. POMI, 441:144–153, 2015, available from: http://mi.mathnet.ru/znsl6230. K. Győry, Sur les polynômes à coefficients entiers et de discriminant donné, Acta Arith., 23:419–426, 1973, available from: https://doi.org/10.4064/aa-23-4-419-426. K. Győry, On polynomials with integer coefficients and given discriminant. V: p-adic generalizations, Acta Math. Acad. Sci. Hung., 32(1-2):175–190, 1978, available from: https://doi.org/10.1007/BF01902212. 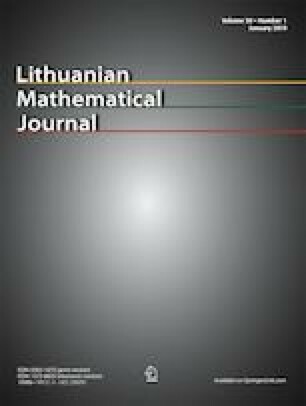 K. Győry, Polynomials and binary forms with given discriminant, Publ.Math., 69(4):473–499, 2006, available from: http://publi.math.unideb.hu/contents.php?szam=69. D. Kaliada, F. Götze, and O. Kukso, The asymptotic number of integral cubic polynomials with bounded heights and discriminants, Lith. Math. J., 54(2):150–165, 2014, available from: https://doi.org/10.1007/s10986-014-9234-z. D. Koleda, On the frequency of integer polynomials with a given number of close roots, Tr. Inst. Mat., Minsk, 20(2): 51–63, 2012 (in Russian), available from: http://mi.mathnet.ru/eng/timb/v20/i2/p51. K. Mahler, Über das Maß der Menge aller S-Zahlen, Math. Ann., 106(1):131–139, 1932, available from: https://doi.org/10.1007/BF01455882. B. Volkmann, The real cubic case of Mahler’s conjecture, Mathematika, Lond., 8:55–57, 1961, available from: https://doi.org/10.1112/S0025579300002126.